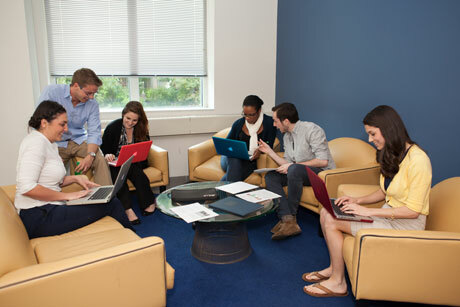 The University Honors Program (UHP) is a selective four-year program open to students in all schools and colleges at GW. The students and faculty who belong to the UHP community share a commitment to a vibrant, rigorous education. The UHP curriculum is designed to enhance and augment the coursework a student does in his or her major. It's built around a series of small pro-seminars, many interdisciplinary in nature and honors program courses provide students with intense intellectual challenge and encourage critical engagement with complex issues. Every semester UHP students have the opportunity to take courses taught by the University Professors of GW, a highly select group comprised of accomplished scholars and excellent teachers that represent a wide range of disciplines. The UHP community extends well beyond the classroom. Freshmen and sophomores have the option to choose Honors housing. Freshmen reside in West Hall on Mount Vernon Campus and sophomores live on Foggy Bottom Campus. The UHP regularly offers an array of activities ranging from local hikes to student and faculty dinners. The popular professors-on-the-town program encourages students and faculty to engage together in events on campus and in Washington, DC. The exceptionally talented and highly motivated students who belong to the UHP routinely have great success in competing for major fellowships and awards, both within GW and nationally.